Experts have slammed a resort planned in the Bach Ma National Park, saying it will destroy and pollute the environment. The central province of Thua Thien Hue had approved a VND1.5 trillion ($66 million) project for a resort complex that would see two cable cars built in the Bach Ma National Park. The province had approved the plan in 2014, and a company partly funded by a foreign investor has been selected for the project. According to the plan prepared by the U.S.-based Wimberly, Allison, Tong & Goo, or WATG, one cable car will stretch more than four kilometers (2.5 miles) to reach the peak of Bach Ma Mount inside the park and the other will run 1.6 kilometers from that peak to a top of a waterfall. The entire project has two parts, with one covering 64 hectares (158 acres) near the gate to the park and the other measuring 300 hectares on top of Bach Ma Mount for accommodation, “spiritual tourism” and recreation services. The plan will also restore and bring back to life 139 abandoned villas along the side of Bach Ma Mount and a tower for sightseeing on its peak that were built by the French in the 20th century. La Thi Kim Ngan, former deputy head of Vietnam Institute for Urban and Rural Planning (VIUP), said the plan has too many projects on top of the Bach Ma Mountain. She said these projects should be moved to surrounding areas, near residential areas, to create jobs for locals and at the same time, save the mountain from many concrete structures. “The cable car from the mountain peak to the fall is unnecessary and should be reconsidered,” she told a meeting held by the province to seek opinions on the plan on Saturday. Nguyen Xuan Hoa, former director of the province’s culture department, seconded Ngan. He said the plan focuses too much on the area at the mountain top and suggested that accommodations and other related services should be moved to the area around the foot of the mountain. 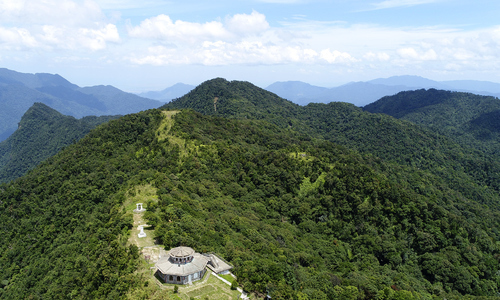 Too many projects on the Bach Ma peak would “overload nature,” Hoa told the meeting and agreed with Ngan that the province should eliminate the cable car to the waterfall. Dung talked about the environmental pollution that the project would generate. He said he was worried that wastewater from tourist activities will eventually flow into the stream inside the park and then to the Huong River that runs through Thua Thien Hue. “Who can guarantee that wastewater from the Bach Ma tourism complex will not cause pollution? I think we should have specific and careful environmental impact assessment for this plan,” he said. He said ecotourism was a way to conserve the environment effectively as it educates people about it, but he did not see any of this in the plan. The Bach Ma National Park was established in 1991 and covers more than 37,000 hectares. It's a one-hour drive to the southeast of Hue, the provincial capital and tourism center which mainly draws tourists to temples and royal tombs that dated back to the time it was the seat of Vietnam's last dynasty Nguyen (1802-1945). The park’s biodiversity is considered one of the richest in Vietnam and the region. Nguyen Van Phuc, deputy director of Thua Thien Hue’s culture department, had told VnExpress last year that it would be a pity if the province failed to develop ecotourism in the Bach Ma Park, with the number of visitors a modest 15,000 each year. The province attracted 3.8 million tourists last year, up 16.63 percent against 2016.